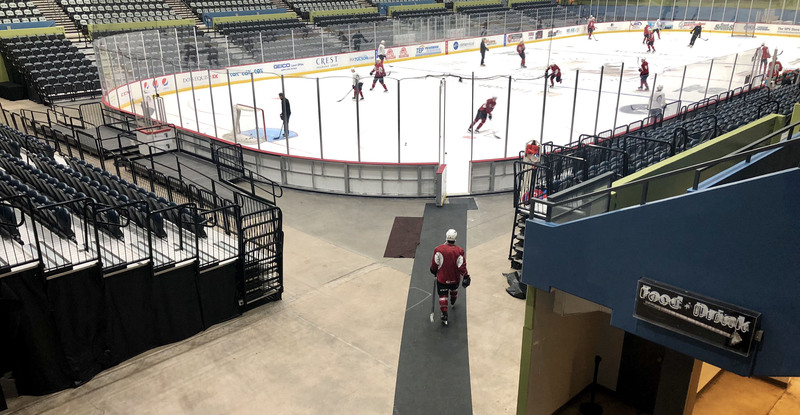 Good morning from Tucson Arena, where in return from a fruitful road trip, the Roadrunners will seek to transition fluently into their fifth game of the campaign, one that calls for a standard 7:05 PM start. 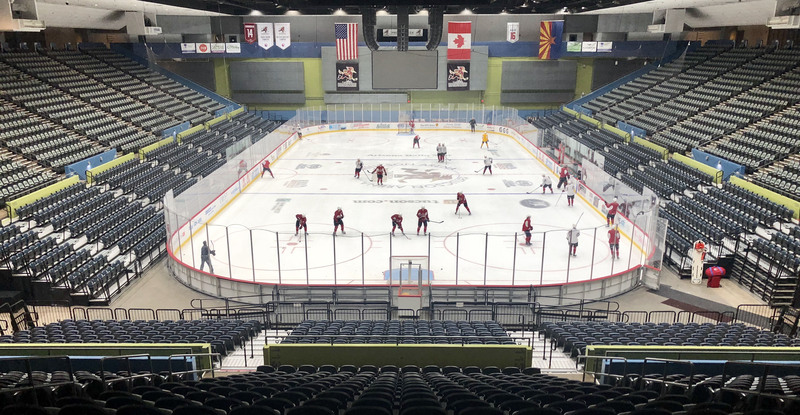 A warm welcome to Southern Arizona on a gorgeous fall day to the 14th opponent in franchise history, the Rockford IceHogs, one of two new teams Tucson will face this season. The IceHogs, proud members of the AHL’s Central Division, have served as the Chicago Blackhawks’ primary affiliate since the start of the 2007-’08 season. And of course! A huge welcome back to Andrew Campbell, the Roadrunners’ captain during the 2017-18 campaign and the second in franchise history. He was part of a trade on July 12 that involved seven names. More on ‘Soup’ below, and throughout the day! Tonight presents the first meeting between Arizona Coyotes and Chicago Blackhawks AHL affiliates since April 5, 2011, when the San Antonio Rampage (ARI) fell to Rockford (CHI) by a 4-2 count. Current Coyotes defenseman and Arizona captain Oliver Ekman-Larsson registered an assist that night. The box score, for your viewing pleasure. 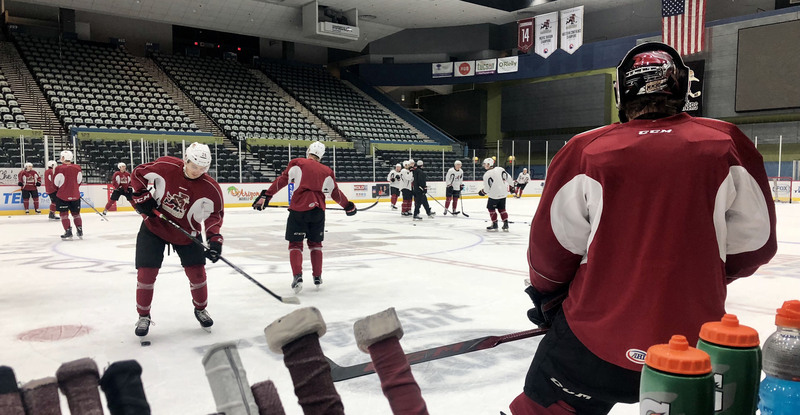 All were present during the team’s morning walk-through, including forward David Ullstrom, who was assigned to the Roadrunners from the Coyotes this morning after season-starting injured reserve and clearing waivers. Forward Domenic Alberga was released from his professional tryout agreement on Wednesday. The roster stands at 24. Ullstrom registered 13 points (6G, 7A) in 49 career NHL games with the New York Islanders from 2011-13, and last season with HV71 in the Swedish Hockey League, totaled 30 points (6G, 24A). He was signed to a one-year, two-way contract on May 15. Especially for our first trip of the year, and in such a tough building to play in in San Diego during their home opener, to find a way to get five out of six points on that trip was a great way to start the trip for us, the season. Their forwards play fast, they get through the neutral zone quick and make a lot of skilled plays, and we’ve just got to be aware of that and try to slow them down as much as we can. It’s always great to be home, to practice at home, to have days at home with your family and stuff like that. We want to build off of the success we had from the home opener and keep riding it forward. It’s awesome. We love “Soup” around here, we miss him, he’s one of the best people I’ve met in hockey as far as what he does in the community, he was a great teammate and I consider him a good friend off the ice. It’s great to have him back, and it’ll be a fun one for him and for us for sure tonight.